Calcium Assay Kit (Colorimetric) ab102505 provides a simple assay to determine calcium concentration within the physiological range of 0.4 – 100 mg/dL (0.1 – 25 mM). In the calcium assay protocol, a chromogenic complex is formed between calcium ions and 0-cresolphthalein. The complex is measured at OD = 575 nm. This calcium assay detects free calcium ions only. 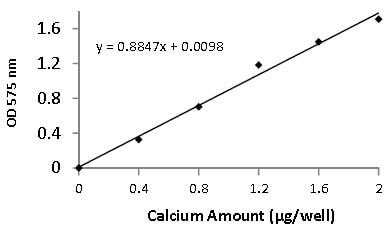 Effect of PFOA on calcium concentrations in cultured human osteoblasts after exposure for 3 or 5 weeks. Plots represent mean ± SD. Ca2+ concentration (millimolar) in various biologicals. Shown bars are average of values from dilutions neat to 1:8. Publishing research using ab102505? Please let us know so that we can cite the reference in this datasheet. I'm interested in the Calcium Colorimetric Assay. I have a few technical questions about the assay and the materials. According to the website the linear range of detection for this kit is between 0.1-25 mM? What about higher that? Will other ions interfere with the measurements? Meaning presence of other divalent or monovalent ions? In my solution there are also presence of MOPS ions and NaCl. What is the binding molecule that binds to the Ca ions? In Sigma it is the o-cresolphthalein molecule. Is the binding of your molecule overcome other interaction with other ions? Meaning that the binding is specific and the presence of other ions do not interfere with the measurement. I'm also looking to measure the concertation of Mg and Zn. I found Magnesium Assay Kit, does it works with different binding molecule? Do they interfere with one another. Is it specific as well? What is the binding molecule in the Mg kit? Is it possible to buy the binding molecule and not the entire kit? 1. According to the website the linear range of detection for this kit is between 0.1-25 mM? What about higher that? It is possible to detect higher amount as well- however, we have not tested it and it may be above the accurate range of the assay. 2. Will other ions interfere with the measurements? Meaning presence of other divalent or monovalent ions? 3. In my solution there are also presence of MOPS ions and NaCl. In testing, for both kits ab102505 and ab102506 we didn’t see an issue with NaCl , however, MOPS was not tested. 4. What is the binding molecule that binds to the Ca ions? In Sigma it is the o-cresolphthalein molecule. Is the binding of your molecule overcome other interaction with other ions? Meaning that the binding is specific and the presence of other ions do not interfere with the measurement. For the calcium assay ab102505 we have a proprietary buffer formulation that prevents interference from Fe and Mg.
5. I'm also looking to measure the concertation of Mg and Zn. I found Magnesium Assay Kit, does it works with different binding molecule? Do they interfere with one another. Is it specific as well? 6. What is the binding molecule in the Mg kit? There are no binding molecules in the magnesium assay kit ab102506 - the assay is based on a reaction where Mg serves as a co-factor. 7. Is it possible to buy the binding molecule and not the entire kit? Unfortunately, I am sorry this is not possible in this case. I am happy to answer any further questions you have. Hi, What is a recommended dilution factor for mouse serum and/or plasma to measure calcium in it? Based on the laboratories experience with the ab102505Calcium Detection Kit, for human serum samples they have either added 10 ul directly or did a 1:2 dilution with assay buffer and added 10 ul to the reaction well. Please note that this is a guideline only and may need to be optimized by individual end users. I used the calcium detection buffer to test calcium concentration in Arabidopsis, it works well. Is the ab102505 Calcium Assay Buffer compatible with the Alkaline Phosphatase Assay, ab83369? I was not able to obtain the composition of the two buffers (they are considered proprietary) but the laboratory has informed me that the buffer in the calcium assay is unlikely to be compatible with the ALP activity assay. That said, you might be able to obtain some ALP activity signal if you you use the calcium buffer for preparing your sample and then testing it for ALP activity, but at the cost of reduced sensitivity, compared to preparing the sample in the ALP kit buffer. You could test whether this will be the case by comparing standard curves using the provided ALP enzyme, prepared with each buffer. Used this product in a standard blank ELISA plate format. Programmed a DiaSorin ETI-MAX to run the procedure. Product worked as specified in dogs with no problems. Have found the curve to be very stable run-to-run. Overall inter/intra assay precision is 5.9% and 3.6% respectively. Used to product to test for serum calciums in cats. Programmed a DiaSorin ETI-MAX to run the procedure on standard ELISA plates. Product performed as specified with an inter/intra assay precision of 4.9% and 3.2% respectively. Anruf: Kundin hat 540nm oder 600nm um zu messen, aber nicht genau 575nm. Ich habe nun einen Bestätigung von Labor: Der Farbstoff 0-cresolphthalein emittiert zwischen 540-600nm. Die spektralen Eigenschaften von 0-cresolphthalein hängen stark vom pH-Wert und der Bindung an Metallionen wie Calcium ab. Da für dieses Kit ein Maximum bei 575 nm erwartet wird, empfehlen wir Ihnen bei 600 nm zu messen. I have samples of blood vessel walls. I would like to quantify amount of calcium (hydroxyapatite) in these samples. Can I use this kit? And how to prepare samples? The blood vessel walls (largely Endothelial cells) samples can be homogenized in the assay buffer (contains detergent to help lyse cells) and then spun down to prepare a lysate. Several volumes of this lysate must be tested to make sure the readings are within the linear range of the std curve. Inquiry: Is this kit (Calcium Detection Kit (Colorimetric) (ab102505)) suitable for determination of ca from human placenta? The sample type of kit as mentioned on datasheet lists tissue extracts, this means the kit is suitable for any kind of tissue sections however you may need to optimize expermental conditions. Inquiry: Can this kit be used for rat serum or rat peritoneal macrophages (supernatant/ cell lysate)? What would be the approx price of the kit in Delhi,India? 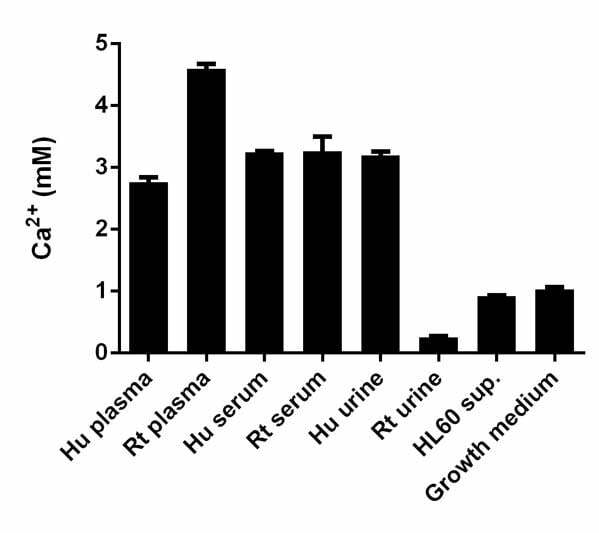 This kit can be used to detect the Calcium with rat serum and cell lysates/supernatant. To know the price please contact our Indian distributor Allied Scientific.